Madix's all-new Luxe displays help retailers create an upscale environment, while maintaining the simplicity of installation that customers have grown to love. Clean lines and versatile slotting allow retailers to upgrade their fixtures, but still utilize Madix Maxi Line accessories. Luxe helps retailers create upscale store environments. Compared to custom fixtures, Luxe is equally attractive, but it is more cost effective and has add on and replacement parts readily available. Luxe is perfectly suited for merchandising a variety of merchandise such as apparel, shoes, and housewares. It's perfect to outfit your whole store or just specific merchandise within departments. 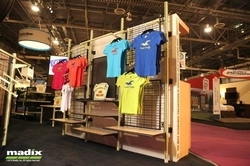 The system's unique round upright allows retailers to build displays from four directions. The new patent-pending display is easy to install, which retailers will appreciate. For more information on how the Luxe display system can enhance your merchandise presentation or a no obligation quotation contact Joseph Solinsky at 410.967.9566 or at joseph.solinsky@indoff.com. At Indoff Store Fixtures + Retail Equipment we are here to help!